A great white shark crosses the water close to Geyser Rock and Dyer Island in front of the South African coast. African penguins, cormorants (or sea ravens), many other sea birds and a large colony of South African fur seals (Arctocephalus pusillus) live here. The surface hunter often finds his prey on the water surface. The super-robber great white shark with its size and strength and fearsome jaws is a permanent danger to the South African fur seals around Dyer Island and Geyser Rock. 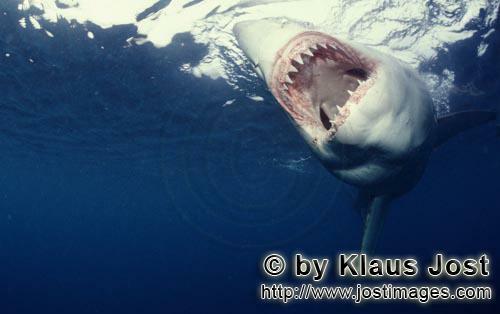 The great white shark belongs to the family of mako sharks and has very large gill slits and long pectoral fins. The largest great white shark ever caught had a length of 6.4 meters and an estimated weight of 1500 kg. In making a surprise attack from the depths they accelerate so fast that they sometimes shoot out of the water. The jaws of the great white shark with their sharp triangular teeth in the upper jaw and the pinpointed tusks in the lower jaw are notorious and dreaded. In order to be able to catch larger prey, the upper jaw is loose (or movable) and can be pushed forward. Lost or damaged teeth are replaced without any problem for a lifetime. The great white shark is the top robber of the food chain and fulfils an important task in conserving the ecological balance in the ocean. There is very little known about their behaviour and habitat. The great white shark exists almost unchanged for millions of years and has adjusted optimally to its environment. But now there is a danger that it will be exterminated by us humans. All texts and pictures present at this website, are protected by international copyright laws. Each kind of the duplication, which is manipulating or storage of pictures without the written permission of Klaus Jost is expressly forbidden.